There is a lot to like about the 2017 L’Ecole Chenin Blanc Old Vines. The Wine Enthusiast rates it 91 Points, a Best Buy, and number 29 on its list of Top 100 Best Buy Wines 2018. The price at the Redwood City Costco is $11.99. That’s a terrific price for this delicious wine. It is $16.99 at Wine.com. The L’Ecole Chenin Blanc is like so many of the excellent wines from the Chenin Blanc capital of the world, Vouvray in the Loire Valley of France. Light and refreshing, and full of aromatics. The L’Ecole Chenin Blanc aroma pops from the glass with loads of flavors. The same goes for its presence in the mouth. We get lemon, stony flavors, and melon. The after taste is excellent. Maybe the old vines planted in 1970 give the wine some minerality. That stony character is a big part of the wine. The acidity is a perfect balance. I am going with 90 Points and hoping to purchase more at the Redwood City Costco. It’s a wonderful picnic or outdoor wine, as well as a wine with seafood and other appetizers. It is perfect for Padron Pepper season. Vintage Wine Taster Mike and I visited the L’Ecola 41 Winery at the 2018 Wine Bloggers Conference in Walla Walla, Washington. 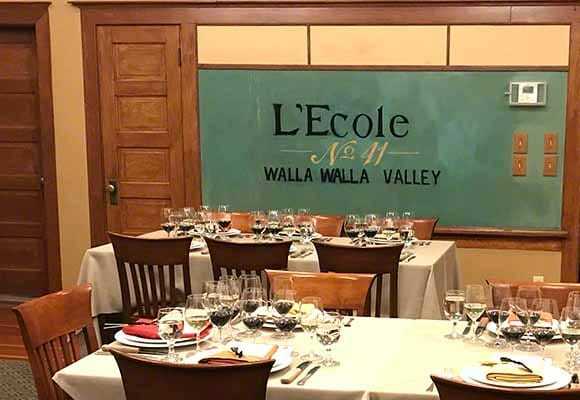 The tasting room is in an old school house, thus the name L’Ecole 41. The winery started in 1987 and is the third oldest winery in Walla Walla. The winery has been making this Chenin Blanc since 1987. On the right, second generation Marty Clubb talks up his wine. Mike Beltran on the left. My wine scouts report that the L’Ecole Chenin Blanc is not at Costco stores in South San Francisco or Foster City. Please let us know if you see this wine at your local Costco Store. Report back in the Comment Section. I spotted the L’Ecole Chenin Blanc at both the Foster City Costco and the South San Francisco, Airport Costco. Great stuff.